CEFEX Certification is based on a Standard developed by the Center for Fiduciary Studies, and used by fi360 and CEFEX for educating professionals and performing assessments. fi360 and CEFEX define an investment fiduciary as someone who is providing investment advice or managing the assets of another person and stands in a special relationship of trust, confidence, and/or legal responsibility. Investment fiduciaries can be divided generally into three groups: Investment Stewards, Investment Advisors, and Investment Managers. An Investment Steward is a person who has the legal responsibility for managing investment decisions, including plan sponsors, trustees, and investment committee members. An Investment Advisor is a professional who is responsible for providing investment advice and/or managing investment decisions. Investment Advisors include wealth managers, financial advisors, trust officers, financial consultants, investment consultants, financial planners, and fiduciary advisers. An Investment Manager is a professional who has discretion to select specific securities for separate accounts, mutual and exchange-traded funds, commingled trusts, and unit trusts. The Prudent Practices for Investment Stewards are for persons who have the legal responsibility for managing investment decisions. Investment Stewards include trustees, plan sponsors, and investment committee members. Each Practice has been substantiated by applicable legislation, regulation, and/or case law to ensure compliance. 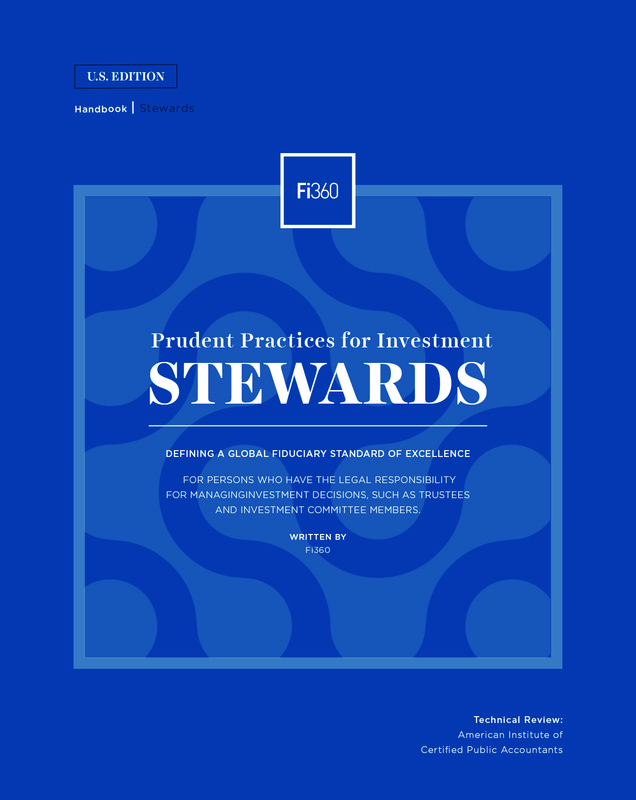 Full citations, as well as detailed Criteria, narrative discussion, practical application, and suggested procedures can be found in the Prudent Practices for Investment Stewards handbook, available for download here. The Investment Steward demonstrates an awareness of fiduciary duties and responsibilities. Investments and investment services under the oversight of the Investment Steward are consistent with applicable governing documents. The roles and responsibilities of all involved parties (fiduciaries and non-fiduciaries) are defined and documented. The Investment Steward requires agreements with service providers to be in writing and consistent with fiduciary standards of care. Portfolio assets are protected from theft and embezzlement. An investment time horizon has been identified for each investment portfolio. An appropriate risk level has been identified for the portfolio. An expected return to meet each investment objective for the portfolio has been identified. Selected asset classes are consistent with the portfolio's time horizon and risk and return objectives. Selected asset classes are consistent with implementation and monitoring constraints. The investment policy statement contains sufficient detail to define, implement, and monitor the portfolio's investment strategy. When socially responsible investment strategies are elected, the strategies are structured appropriately. A reasonable diligence process is followed to select each service provider in a manner consistent with obligations of due care. When statutory or regulatory investment safe harbors are elected, each investment strategy is implemented in compliance with the applicable provisions. Periodic reports compare investment performance against appropriate index, peer group, and investment policy statement objectives. Periodic reviews are made of qualitative and/or organizational changes of Investment Advisors, Investment Managers, and other service providers. Control procedures are in place to periodically review policies for trading practices and proxy voting. Periodic reviews are conducted to ensure that investment-related fees, compensation and expenses are fair and reasonable for the services provided. There is a process to periodically review the Steward's effectiveness in meeting its fiduciary responsibilities. The Center for Fiduciary Studies is the standards-setting body for CEFEX and fi360 and is supported by a team of experienced investment practitioners, attorneys, educators, and other professionals. The Center for Fiduciary Studies developed and maintains the "Prudent Practices for Investment Stewards" handbook.